The valley is called the Pacamayo, Quechua for 'sunrise'. Descending is hard for the knees so we took our time. Several small camping spots can be found in the Pacamayo valley. An unwritten rule on the Inca Trail says that whoever takes a free spot claims this for the night. Usually it are the agencies that send their chasquis out with tents to occupy the best places early in the day. Mind this if you make the trail alone or with a small group. 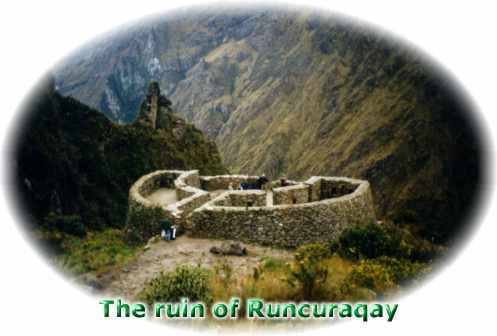 Our chasquis arrived at location, high above the Runcuraqay, before others did. So we were lucky to have a campsite just next to a little lake with a fantastic view over the Pacamayo Valley. Runcuraqay is located halfway the ridge. This well restored little ruin functioned as a lookout post, a temple of the Sun and a resting place for the chasquis. The Incas were practical builders where ethics, strategy and religion lived harmoniously together. We couldn't find Zenon and his friends. We were all starving and dreaming about a regenerating dinner so we continued the Trail. Finally, after climbing a vertical distance of 2km we arrived at our next campsite. Dinner was ready. After erecting our tents we discovered the neighborhood. The temple, the deep Pacamayo Valley and de subtropical forest were all united in one view, pure magic. The blue sky was often covered by the fast rising clouds coming out of nothing, rise quickly where they dissolve. 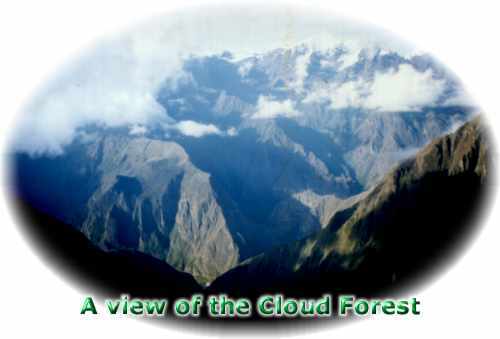 That's why these forests are often called 'the cloud forest'. White summits surrounded us everywhere we could see. Simply beautiful!